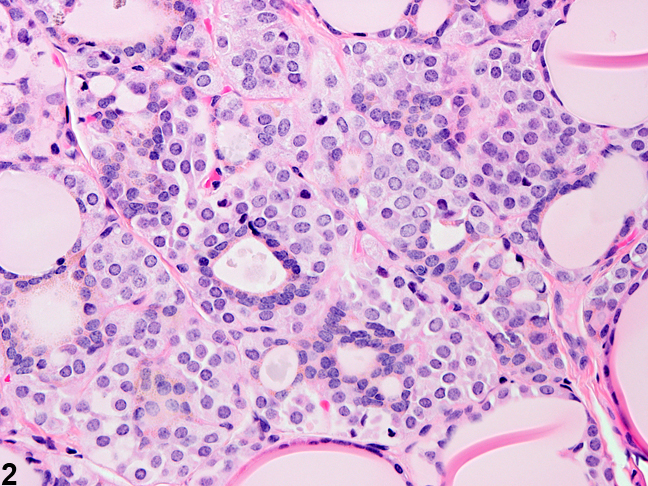 Thyroid gland, C cell - Hyperplasia in a treated female F344 rat from a chronic study. Aggregates and small nests of C cells have replaced follicles in this thyroid gland. 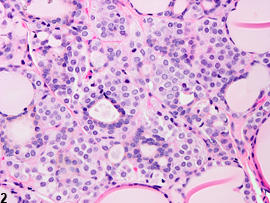 Thyroid gland, C cell - Hyperplasia in a treated female F344 rat from a chronic study. Higher magnification of Figure 1 shows the contiguous nests of C cells surrounding small follicles. 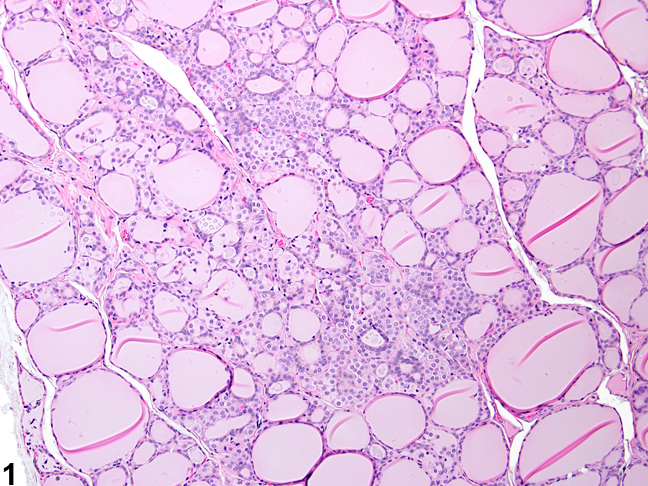 Thyroid gland, C cell - Hyperplasia in a control male F344 rat from a chronic study. 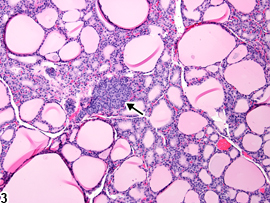 A focal proliferation of C cells is present in this thyroid gland (arrow). 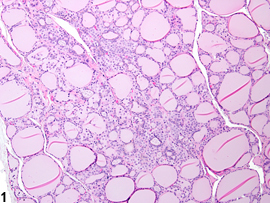 Thyroid gland, C cell - Hyperplasia in a control male F344 rat from a chronic study. Higher magnification of Figure 3 shows illustrates the high nuclear-to-cytoplasmic ratio in this focal proliferation of C cells. C-cell hyperplasia is a common finding in chronic rat studies and can be diffuse ( Figure 1 and Figure 2 ), focal ( Figure 3 and Figure 4 ), or multifocal. C-cell hyperplasia is distinguished from C-cell adenoma based on the size of any given focal proliferation. 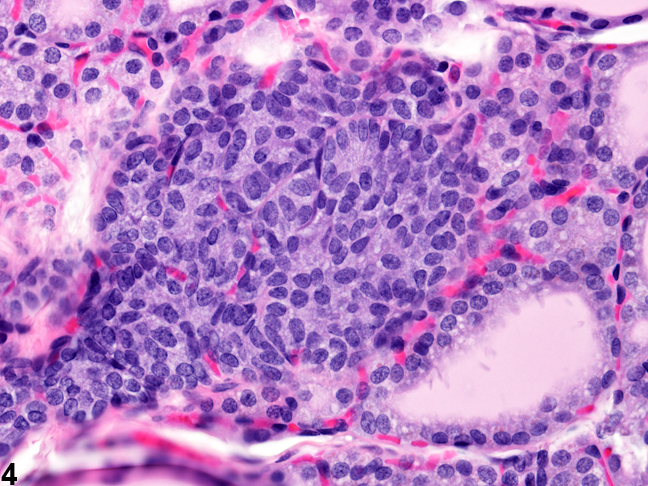 The generally accepted criteria for C-cell hyperplasia is a focal C-cell cluster less than five average follicular diameters or similarly small-sized clusters of C cells scattered in interfollicular spaces. In contrast to C-cell adenomas, C-cell hyperplasia is not associated with significant compression of adjacent parenchyma. 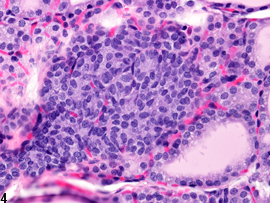 C-cell hyperplasias may contain individual trapped follicles ( Figure 1 and Figure 2 ). C-cell hyperplasia generally consists of round to polyhedral cells with abundant eosinophilic cytoplasm ( Figure 2 ); in some cases there is a higher than typical nuclear-to-cytoplasmic ratio ( Figure 4 ). C-cell hyperplasia should be diagnosed when present, given a severity grade. If bilateral it should be indicated in the diagnosis with a severity grade based on the more severely affected thyroid gland. Capen CC, Martin SL. 1989. The effects of xenobiotics on the structure and function of thyroid follicular and C-cells. Toxicol Pathol 17:266-293. Chandra S, Hoenerhoff MJ, Peterson R. 2013. Endocrine glands. In: Toxicologic Pathology: Nonclinical Safety Assessment (Sahota PS, Popp JA, Hardisty JF, Gopinath G, eds). CRC Press, Boca Raton, FL, 655-716. Collins WT, Capen CC, Kasza L, Carter C, Dailey RE. 1977. Effect of polychlorinated biphenyl (PCB) on the thyroid gland of rats. Ultrastructural and biochemical investigations. Am J Pathol 89:119-136. Greaves P. 2007. Histopathology of Preclinical Toxicity Studies: Interpretation and Relevance in Drug Safety Evaluation, 3rd ed. Academic Press, Amsterdam, 819-839.